Kumari Kaandam (skt. Kumari Khantam) is a submerged landmass that existed to the south of what is now Kanyakumari, the southern tip of India. There are many web sites discussing about this enigmatic landmass comparing it with Atlantis, Lemuria and Sunda Land. Many depict it as a huge landmass to the south of India so large that it connect with Madagaskar near Africa and Australia in the south east. Such a huge landmass is ruled out by geological studies and seems to be fancy of some enthusiasts. I thought of investigating the matter myself and found out many promising leads. A submerged landmass similar in description to Kumari Kandam existed to the south of Kanyakumari during the peak of Last Glacial Maximum (LGM) when sea level was around 120 +/- 10 meters lesser than current levels. During that time all of the continental shelf (shallow floor of sea near continents) around India was above sea and existed as landmasses. Kumari Kandam as revealed through Bathymetric studies. Sea Level at 130 meters lesser than current levels (-130 m) around 19500 BCE at LGM. Besides the sea level changes, the ocean surface elevation changes due to local tectonic activities to the south of Kanyakumari too is considered. The names of rivers and places mentioned in Tamil literature like Tenmaturai, Kapatapuram and the future city Maturai are indicated. The Devasura civilization mentioned in Sanskrit Vedic literature also is indicated. Kusasthali mentioned in Mahabharata and the Submerged city of Varuna mentioned in Bhagavata too are indicated. The locations are currently speculative, but should give impetus for future marine archaeological studies. To create this map, sea level as a function of time especially since LGM is plotted and compared with the bathymetric contours of Indian Ocean. The accuracy of the contours are limited to 5 km and hence some surface features like small lakes and bays may be missed. The data is also compared with a DTM (digital terrain map) of Indian Ocean surface at a resolution of 100 km / cm. The Tamil texts are the main source of the sub-merged landmasses especially those to the south of Kanykumari. The western extent of this sub-merged landmass is mentioned in Sanskrit texts which describe many submerged cities in this region. Silappatikaram in its third book Maturai Kaandam (Verses 17-22) states that the sea took the Pandya land that lay between the rivers Pahruli and the mountainous banks of the Kumari. Subsequently the Pandiyan king conquered lands belonging to the Chola and Chera kings. In Silappatikaram, Kaadu Kaan Kaati (17-22) we have the following narration:- The Paandya King, having lost Kumari of many hills and the river Pakruli, conquered the Ganges and the Himalayan regions in the North and ruled them from the South. (Paavanar's commentry). The city of Mathura on the banks of Yamuna seems to be the result of this Pandya rule in the north. Silipathikaram Chapter 20: 17–20:- The river Prahuli, and the mountain Kumari, surrounded by many hills, were submerged by the raging sea. A 12th century commentator on the epic named Adiyarkkunallar, described the Silappatikaram reference as a land to the south of the present-day Kanyakumari, which stretched for 700 kavatam (kaatham) from the Pahruli river in the south to the Kumari river in the north. A hill named Kumari hill stood along the banks of Pahruli river in the south. This land was divided into 49 Naadu, or territories (probably of the size of small districts) between Kumari river and Pahruli / Prahuli / Pakruli river. These are named as seven coconut territories (Ezhu Tenga Natu), seven Madurai territories (Ezhu Maturai Natu), seven old sandy territories (Ezhu Mun-palai Natu), seven new sandy territories (Ezhu Pin-palai Natu), seven mountain territories (Ezhu Kunra Natu), seven eastern coastal territories (Ezhu Kuna Karai Natu) and seven dwarf-palm territories (Ezhu Kurum Panai Natu). All these lands, together with the many-mountained land that began with Kumari-Kollam, with forests and habitations, were submerged by the sea. Two of these submerged Nadus or territories of Kumari Kandam were supposedly parts of present-day Kollam and Kanyakumari districts. The above description match perfectly with our Kumari Kandam map developed using bathymetry studies since it shows the western extent of Kumari Kandam along the coast of Kerala where lies Kollam. In the Tamil epic known as the Manimekalai (the sequel to Silappatikaram) there is a statement that the ancient port-city of Kaveripumpattinam (Pukaar) had been flooded by the sea. This event could be linked with the deluges mentioned as linked with Sangam. A king named Nediyon is mentioned in Tamil Puram poems. It starts praising the king like this:- "King Nediyoon who organized sea festivals should live many years more than the number of sands of the river Pakruli that has pleasant waters." This Paandya King was also known as Adivadivambalam and Jeyamaakiirtti. He dug many canals from this river and fostered agriculture along with ruling the nations of Oli Nadu, Peruvala Nadu, Kumari Nadu and many others. Skanda Purana (Kanta Purana) mentions Kumari Kandam (Kumari Khanta) as one of the nine continents / divisions of India. It is described as the only region not to be inhabited by the Mlechchas (barbarians). 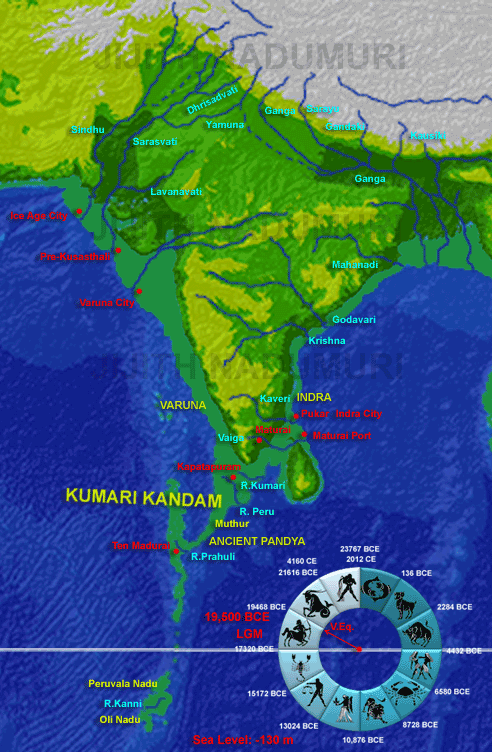 Skanda Purana is also the source of the term Kumari Kandam which was latter applied to all the submerged landmasses described in the Tamil texts. As per this text, this land mass was known as Kumari because of the worship of Kumari deity. Kalithogai,a Tamil poetic work, is the sixth book of Ettuthokai, a Sangam literature anthology. Kalithogai contains one hundred and fifty poems and were written by various authors. Nachinarkiniyar (6th - 7th century CE) has annotated this work. It contains many scattered references to Kumari Kandam or rather a submerged landmass in the region of our study. It mentions about a third capital of the Pandyas named Manavuur after Kapatapuram was submerged and before Madurai was established. The modern equivalent of a kaatham / kavatham is unknown. Hence, the estimates of the size of the lost land vary from 2,300 km 11,000 km in length. The total area of land sub-merged too is not very certain. It could be close to the area of just a few villages to as large as modern day Tamilnadu-Kerala states. As per one source, one Kavatam equals 10 miles. Hence 700 kavatams equals 7000 miles or 11,200 km. The distance between the Southern tip of Kumari and Antarctica is only 8,500 km. Hence this equation is plainly wrong here or the poets had done some exaggeration or made some error in the oral traditions which describe the length of the submerged landmass. From our analysis the distance between Kumari river and Pahruli river is around 600 km. Thus the north-south distance of Kumari Kandam would be roughly 650 to 700 km. The total distance of the contiguous landmass (which includes what is now Maldives) consisting of Kumari Kandam, Peruvala Nadu and Oli Nadu is around 2300 km. This analysis requires that some of the lands described like Oli Nadu lied in what is now southern most Maldives islands. The location of Ten-Madurai would be close to Male, the capital city of Maldives, located a few kilometers to the east of Male, which would now be in submerged condition. First and Second Academies (Sangams) that were established to develop Tamil Language were destroyed by the sea. These events were first mentioned by Sangam poets in their literary work. They also existed in oral traditions. Much later the Sangam commentators like Nakkiirar (10th century) ( who gave commentary to Iraiyanaar Akapporul) Naccinaarkkiniyar and Adiyaarkku Nallaar, followed these traditions and expanded the information, probably by collecting various oral traditions. A total of 2000 poems were composed in the period of three Sangams, lasting for a total of 10,040 years. These poems are broadly categorized into Pattu Paattu (Ten Idylls) and Ettu Tokai (Eight Anthologies). The first Sangam (Mutar Cankam) was in existence for 4400 years. It was held under the patronage of 89 Pandya kings and was attended by 4449 poets. The 89 Pandya kings were in a lineage starting with Kaysina-valudi to Kadungon. The Tamil text dealing with Tamil grammar, viz. Agattiyam, a work of Agastya, a Vedic seer and sage, is assumed to be belonging to the first Sangam. Sage Agastya is mentioned in the Vedas as one among the seven sages (Saptarshis) who frequently appear as the founders of civilizations soon after a deluge. They are also found in Sumerian myths as the founders of Sumerian civilization, soon after a deluge. Some consider Agattiyam to be part of the second Sangam. Other texts mentioned as part of first Sangam are Paripadal, Mudunarai, Mudukurgu and Kalariyavirai. The first Sangam was attended by the Devas like Siva having braided hair, Kubera the lord of great wealth and Murugan (Skanda) of the hills- an indirect indication that it was attended by the members of Devasura civilization. It was held at Ten Madurai, a city that lied in the southern part of Kumari Kandam, which is now submerged. The second Sangam (Itai Cankam) was in existence for 3750 years. It was held under the patronage of 59 Panday kings and was attended by 3700 poets. The Pandya kings Vendercceliyan to Mudattirumaran formed a lineage of kings during this period. Tolkapiam (Tol Kavya, the Ancient Poem) the oldest surviving Tamil text dealing with Tamil grammar is part of the Second Sangam. It mentions many text contemporary to it and older to it like Agattiyam which are lost for ever. The Agattiyam, the Mapuranam, Isainunukkam, and Budapuranam were other texts mentioned as belonging to this period. They dealt with grammar. The Agattiyam of second Sangam seems to be a revision of the Agattiyam of the first Sangam. It was held at Kapatapuram, a city that lied in the northern part of Kumari Kandam, which is now submerged. The third Sangam (Katai Cankam) was in existence for 1850 years. It was held under the patronage of 49 Pandya kings and attended by 449 poets. King Mudattirumaran (who came away from Kapatapuram to present Madurai) to Ukkirapperu-valudi were decedents and rulers of that period. It was held at Madurai city along the banks of Vaigai river in southern Tamilnadu which exist even now. This city was also known as Uttara Madurai (skt) and as Vada Madurai (tamil), both meaning northern Madurai. End of 3rd Sangam is varyingly dated to 350 CE to 550 CE. Ramachandra Dikshitar proposes that ‘the end of the fifth century AD marked the extinction of the Academy. The duration of the three Sangam periods, viz. 4400 years, 3750 years and 1850 respectively resembles the duration of Rta, Treta and Dvapara Yugas as 4400 years, 3600 years and 2400 years respectively based on the 12,000 year long Markandeya MahaYuga / ChaturYuga system. Both represent a declining phase after human civilization achieved a technological and spiritual high close to the end of last ascending Rta Yuga (around 14,700 BCE) (See:- Kalachakra). We also have a refined Markandeya ChaturYuga from which Markandeya had approximated his 12,000 year long ChaturYuga. This refined MahaYuga System is 12,888 years long (half of the axial precession period of 25,776 years) in its ascending phase (Kali-Dvapara-Treta-Rta) and same years long in its descending phase (Rta-Treta-Dvapara-Kali). As per this, the constituent Rta, Treta, Dvapara and Kali Yugas are 5155.2 years, 3866.4 years, 2577.6 years and 1288.8 years long (Refer Kalachakra). Here too the second Sangam period duration (3750 years) matches well with Treta Yuga duration (3866.4 years). The end of third Sangam at 350 CE is considered as the anchor point of pre-history to date Tamil Sangams. This is similar (but less accurate) to the use of 3102 BCE Kali Yuga start as the anchor point of pre-history to date the four Yugas mentioned in Sanskrit texts. Using 350 CE as the anchor, we have the 3rd Sangam at Madurai established in 1500 BCE; 2nd Sangam established at Kapatapuram in 5200 BCE (close to the birth of Rama, 5114 BCE in Treta Yuga) and 1st Sangam established at Ten Madurai in 9600 BCE. Graham Hancock, in his book Underworld has arrived at the same dates. This calculation however assumes that there were no interval between the destruction of a former Sangam Academy and the establishment of the subsequent Sangam Academy. Besides, Hancock is not correlating the Sangam duration with the Yuga duration, though he notes the similarities in the duration. Another possibility considering the correlations with Chatur Yuga System is as follows:- The 1st Sangam of 4400 years coincided with the 4400 year long descending Rta Yuga and the 2nd Sangam of 3750 years with the 3600 year long descending Treta Yuga (which is 3866.4 years long in the Refined Markandeya Chatur Yuga System). There is no correlation of Sangam Ages with the Dvapara Yuga. It also extended to the historical periods in common era. Thus third Sangam most likely occurred in the ascending Kali Yuga of the new Yuga Cycle that succeeded the descending Kali Yuga of the last Yuga cycle. Based on this reasoning, we get 1st Sangam period as flourishing between 14,000 BCE to 9500 BCE (exactly in 9546 BCE) culminating in the submergence of TenMaturai in 9500 BCE. Around 9500 BCE Atlantis submerged. Around 9500 BCE Treta Yuga Dawn began. Mahabharata mentions about a great calamity during Rta-Treta Yuga junction, including global floods. The 2nd Sangam period flourished between 9,200 BCE (start of Treta Yuga proper) and 5500 BCE (exactly 5474 BCE) culminating in the submergence of Kapatapuram. The remnants of Kapatapuram is mentioned as Kavaata (gateway) to Paandya in Ramayana, as part of the search for Sita by the Vanara armies. Going with the date of Rama as 5114 BCE, this search can be dated to around 5077 BCE (Rama goes to forest at the age of 24 and completed 13 years of forest life when the search for Sita commenced). The wide land-bridge between India and Lanka too submerged around 5500 BCE probably along with Kapatapuram, because of which Rama had to create an artificial bridge to reach Lanka around 5077 BCE. The 3rd Sangam period flourished between 1700 BCE (Ascending Kali Yuga Dawn Start) to 150 CE. Based on various sources or oral traditions, Kumari Kandam submergence occurred in three, five or seven stages. Often, these traditions also correspondingly count three, five or seven Sangam academies flourishing at various capital cities of Pandyas, each of them except the last one having lost to a submergence event. Those who count seven stages of submergence place 1st submergence at 16,000 BCE, the 2nd one at 14000 BCE, the third at 9600 to 9500 BCE and the fourth at 5500 BCE to 5200 BCE. They count the fifth submergence as having occurred around 3100 BCE and a sixth at 1800 BCE. The 7th submergence is then dated at 1700 BCE to 700 BCE. Manavuur is a city to the north of Kapatapuram that got submerged in 3100 BCE or in 1800 BCE (most probably in 1800 BCE). Those who count five stages of submergence skip the fifth (3100 BCE) and the sixth (1800 BCE) submergence events of the seven staged submergence scenario. These two skipped submergence events seems to be minor submergence events causing less trouble to the people or it may be that the area submerged were not very big. Interestingly, the Dvaraka submergence occurred in 3102 BCE which is counted as the start of the descending Kali Yuga. Similarly the descending Kali Yuga ended and the ascending Kali Yuga of the new Chatur-Yuga cycle started around 1800 BCE. The three stages submergence is the most popular and the most repeated scenario in the Tamil texts. This could be because, the minor submergence events at 3100 BCE and 1800 BCE were forgotten by the later traditions, along with the oldest submergence events at 16000 BCE and 14000 BCE. The sea swallowed the southern parts of Kumari containing the capital Ten Madurai. This capital contained within it the First Sangam Academy that fostered the growth of Tamil language. This is first submergence that's mentioned by Sangam texts. Based on various sources, this event is dated around 9,500 BCE to 16,000 BCE. As the Southern parts were swallowed by the sea, a Pandya King made Kapaadapuram to the North the new capital. The Second Sangam Academy was established here. The other names of Kapaadapuram are: Kapaadam, Katavam, Puatavam Alai Vaay and so forth. The "alai-vaay" indicates that it was a city on the shores of the sea. This city was also destroyed by the sea. This is considered the Second Submergence. The Pandya King who escaped this deluge, captured parts of the Chera (Kerala) and Chola territories and established new settlements there. Valmiki Raamayana mentions about a Kavaata (door or gateway) to the Paandya kingdom as part of the places to be searched by the Vaanara army to find Sita. This Kavaata (door or gateway) could be a reference to the Kapaatapuram if we consider the possibility that Kavaatapuram and Kapaatapuram are same. The second submergence is dated around 5500 BCE to 5200 BCE very close to the date of Raama (5114 BCE) arrived at through the archeo-astronomical studies on Raamayana-verses that describes the position of planets with respect to the stars when Raama was born. In the Mullai part of Kalittokai (104:1-4) there is historical narration of Three Academies in the commentary to Iraiyanaar Akapporul. Here there is mention of two rising of the sea. On account of Kapatapuram being swallowed by the sea, Manavuur, that was on the banks of Kumari and further north became the new capital of the Pandyas. This is the third Submergence that the literature mentions. As Manavuur was swallowed by the sea (which would then be a 4th submergence), Pandyas made Madurai on the banks of Vaikai, the new capital where the Third Sangam Academy was established. As per another source, at the time of Tolkaappiyar (orthodox dating:- 6th or 7th cent. BCE) the river Kumari was flowing towards the South. The great cities of southern Madurai (Ten-Madurai or Dakshina Madurai) and Kapatapuram where the first two Sangams were said to be held were located in Kumari Kandam. The third submergence is varyingly dated to 1500 BCE to 700 BCE. A point to be noted is that most of the Tamil texts which containes references to Kumari Kandam as a submerged landmass to the south of India are post-Vedic literature. They are varyingly dated from 500 BCE to 500 CE by orthodox chronology. However the dating of the texts do not say anything about the dating of information contained in the texts. This is same in the case of dating of the Vedas, Ramayana, Mahabharata and the Puranas. In case of Sanskrit texts like Vedas, Epics and Puranas dating of information content can be done using the archeo-astronomical observations present in them. These are used to accurately date these Sanskrit texts since orthodox chronology that was used to date them in the 20th century (based on AIT) is useless and is being phased out. Tamil texts in most cases do not contain such observational data as far as I know. The search is on. Next option is to correlate the description of the shape of Kumari Kandam, its geography, geology and climatic conditions with the similar conditions that existed in the region in its geological history. Such an analysis points to a period close to LGM (Last Glacial Maximum) when anything close to Kumari Kandam mentioned in Tamil texts existed in south India. However this was close to 19,500 BCE. The issues with this date is many. It is beyond the comprehension of orthodox archaeology and human history to think of a civilization as advanced as the one described in the Tamil text as existed in Kumari Kandam to be present there at 19,500 BCE. Besides, the first ever flood mentioned in Tamil and Srilankan texts occurred around 16,000 BCE. During this time, much of the landmass that we have identified as Kumari Kandam had already disappeared due to an accumulated sea level rise of around 10 meters during 19,500 BCE to 16,000 BCE. One possible reason could be that the memory of the shape of Kumari Kandam continued to exist in the minds of the inhabitants who continued to interact with the remnant lands through their expertise in marine navigation. Thus it is theoretically possible for the city of Tenmaturai to exist in the location shown in the map in 16,000 BCE or even in 9500 BCE, in a yet to be submerged island, while most of the land mass had already sunk. It was a puzzle for the historians who studied about Tamil literature and Kumari Kandam that most of the terminologies related to the subject matter had a Sanskrit etymology rather than a Tamil one. Examples include the very name 'Kumari Kandam', the 'Vrigin Island' or the 'Virgin Continent' and the term 'Sangam' (literary congress of Tamil poets, held at various cities in the submerged Kumari Kandam at various periods separated by many thousand years). Both are Sanskrit name with no Tamil equivalents. There are many such terminologies and many place names like Kapatapuram essentially Sanskrit in nature. This is no longer a puzzle now that it is very clear that both Tamil and Sanskrit represent two complementary languages that expressed the same Vedic culture. The erroneous AIT (Aryan Invasion Theory) was the cause of the former confusion since it divided the Tamil speaking South Indians as Dravidians and the North Indians who speaks languages directly derived from Vedic / Sanskrit / Prakrit (with substantial Persian influence) as Aryans. This 20th century concept is now discarded and it is very clear that the whole of Indian sub-continent had a single vibrant culture with plenty of regional variations. Besides, Tamil language is a Vedic language established by sage Agastya, a Vedic seer who authored its grammar and transformed it into a language capable of carrying information for the future and into a language suitable for authoring poems and other literary works. Sanskrit language too was developed in the same manner by the Vedic seers. Thus both Tamil and Sanskrit languages are two different language media to express the same Vedic culture. The Paandya kings who is mentioned as ruled in Kumari Kandam worth some mention. The name Paandya (Paantya) is derived from the Tamil word 'Pandu' (Pantu) meaning 'very ancient', 'old', 'olden time'. Pantu (Punt) is also considered as the origin of Egyptians who locate the direction of Punt to the South East of Egypt beyond the eastern sea of Egypt. Thus it is clear that the source of ancient Egyptian culture was this ancient Paantya kingdom that existed in the sub-merged Kumari Kandam. Thus we we get to know, by analyzing the Tamil and Sanskrit texts, descriptions of many submerged cities. Examples are the Sangam cities like Ten-Madurai and Kapatapuram that submerged during the 1st, 2nd and 3rd Sangam as per Tamil texts. These cities lied on a land-mass which existed during the end of the last Ice Age and hence are called Ice Age cities. There are many such cities described in Sanskrit texts as well. Mahabharata mentions about a sub-merged city named Kusasthali which existed south of western sea-shore (now Gujarath coast). Krishna built the new city Dwaraka upon the ruins of this sub-merged city. Towards the end of Dvapara Yuga (3102 BCE) Dvaraka too submerged. Mahabhagavata mentions about the city of Varuna in the western ocean. Krishna and Balarama is mentioned as visiting this city that lied underwater. The description make it clearly a sub-merged city. Varuna is mentioned in the Puranas as the ruler of the west, identifiable with the western shores of India that were a fertile plain during LGM (19,500 BCE). It was submerged close to 8600 BCE.